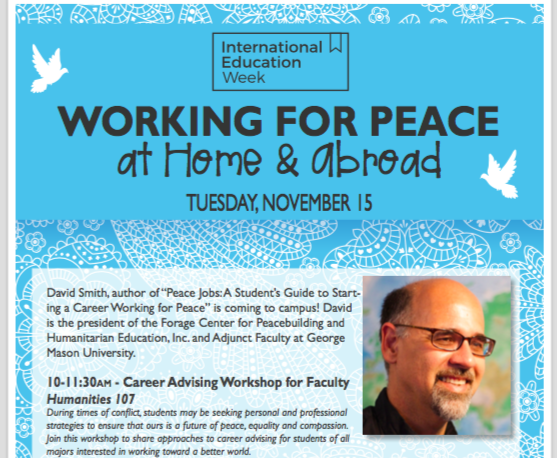 In November I will be traveling to southern California to visit Golden West College (Tuesday, 11/15) and Soka University (Wednesday, 11/16) to give talks and workshops on peacebuilding and career awareness. At Golden West College I will be offering a career advising workshop for faculty and staff, having a book signing for Peace Jobs: A Student’s Guide to Starting a Career Working for Peace, and offering a career exploration session for students. Golden West College recently established an associate of arts degree in peace studies. At Soka University, the only Buddhist affiliated institution in the U.S., I will be giving talks on peacebuilding and career awareness. If you are interested in attending these events, let me know at davidjsmith@davidjsmithconsulting.com.